Treat yourself and your company to our great brunch buffet. 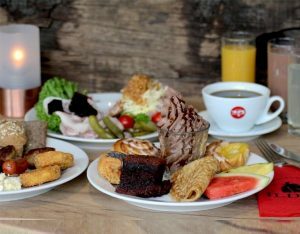 For the rest of 2019 you can enjoy our brunch buffet for only DKK 149 – applies to our Restaurant in Copenhagen. Remember! Our brunch buffet always includes: coffee, tea, juice, lemonade, cocoa milk and water. Our brunch buffet is the perfect starting point for a cozy day in Copenhagen. We are located right by the Town Hall Square a few hundred meters from both Tivoli and Strøget. See you at our brunch buffet at Restaurant Ilden in Copenhagen!